Sometimes plain and simple is just what I crave. These are perfect! I love those cupcake liners; where did you find them? I love plain and simple cupcakes. :) YUM! Thanks! Lovely, lovely!! I want to eat it right from the computer monitor! Yum, yum, yum…it’s a gray rainy day in the NL, red tent time is fast approaching, and I’d love to be on the couch right now with those cupcakes! these are just lovely. With so many fancy, ornate cupcakes, it is refreshing to see some plain and simple, yet elegant ones in terms of design and flavor! The shine on that chocolate frosting almost had me trying to eat it off the pc screen! They look delicious, perhaps my treat to myself on Mothering Sunday this weekend! As always, thanks for your acccurate reporting. And thanks, too, for always posting your recipes. my favorite cupcakes are simple chocolate and vanilla (although i’ll rarely turn down a cupcake of any stripe). these are too cute for school. i’ll have to try the chocolate, as i’m not 100% in love with my current chocolate cupcake recipe. i do have a vanilla buttercream that i love, though. Sometimes, a great version of an old classic is just what you need. These look like an exceptional take on the popular favorite! Yep that’s why I stick to the basics for my business, chocolate, vanilla and carrot! And I agree, Valrhona chocolate makes all the difference for chocolate ones. I just made the butter cream icing you posted and it is yummy!!!! I used it to frost cupcakes for my daughter’s class and thankfully there was some left over – my youngest and I are sharing it now. :-) So much better that those recipes with shortening in them. THANK YOU!!!!! I used the frosting in bags to pipe it on the cupcakes and had to let it set in the fridge to harden a bit but I will be using it again and again. I made a chocolate guiness cake last night (nigella lawson) and the frosting was cream cheese and powdered sugar, but used heavy cream instead of butter. 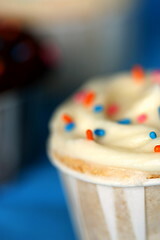 It was like your vanilla frosting above–better for swirling than for piping. It was so incrediblly creamy (because of, well, the cream duh)and had a beautiful shine. I’ve been a fan of your cupcakes for ages, but dont’ think I’ve ever left a comment. Keep up the fantastic work. I love the frosting, but I do not know what happened with my vanilla cupcakes. They are horrible! I was actually wondering if the recipe is correct? I am not sure what I did wrong… Oh well! Love the frosting! The recipe is correct. How were they horrible? I am sure I did something wrong. But I don’t know what it was. The cupcakes came out with a strange crunchy, almost crystallized top, and were doughy in the middle. Filled only 2/3’s full. I tried to retrace my steps, and can’t pick out where I went off track. I did use Trader Joe’s Evaporate Cane Juice instead a regular granulated sugar. Could that be it? I bet it is! Hey, you have been tagged! For more info on tagging please visit my blog! i love simple. and i love your cupcakes because not only do they look good, they taste phenomenal too. I would definitely try that chocolate recipe because i’ve been on the lookout for a GOOD chocolate cake recipe. The ones i’ve tried has disappointed me so far. and that frosting looks soooo good. Ohh yay, another vanilla cupcake recipe to try! Lucky, lucky children to have such wholesome ingredients in a cupcake. What a good auntie you are! You ever inspire me to get into the kitchen and play around some more. Those look like you put a lot of work into them and they look deelicious! Please help. I’d like to make these this weekend, but noticed something in the vanilla cupcake recipe. It calls for one egg, yet the directions say, “Add eggs one at a time, beat for 30 seconds between each.” Which is correct? Ohhhhh I love your site so much! Your recipes are truly heavenly! Where do you get your inspiration? I hope you don’t mind I’ve added you to my links. Have a lovely weekend and a lot of cupcake love from me! Sorry! I halved the recipe, but missed that step in the instructions. I cleaned them up… Its only one egg. Thanks. I’ll make note of that on the recipe. ooooh sprinkles!!! my son loves em’ … he will even eat zucchini if it has sprinkles on it …[not really ..lol]. 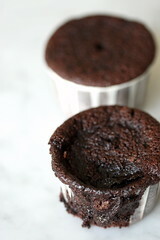 thnx for the old-fashioned chocolate cupcake recipe .. was looking for one! Same as 17 and 34 but for chocolate. What have I done wrong as I followed the measurements and methods to the T. Crunchy top and sunken cake even it was measured 2/3 full. Tastes delicious nonetheless and I scooped them out for raspberry chocolate trifle instead. I am in the process of making the vanilla cupcakes and I am suddenly wondering if you forgot to halve the sugar when you re-wrote the recipe?! There is more sugar in these than flour, which is not the typical ratio, even for a slightly sweeter than normal cake. Actually, I think I’m going to cut the sugar in half and see what happens. will definently use this recipe. one question – will the frosting be stiff enough to be pipeable after chilling? Heather & Su, The commenter in #17 substituted the sugar for cane juice, hence why the recipe failed. This is to be expected. If you followed it to a T, like you said, then the other issue could be oven temperature (or specifically an oven that is not hot enough. I will test this recipe a couple of times more to see if I can make it bullet proof, but that is tough. There are many competing factors when it comes to baking success. I know it worked for me and other posters, so it can be a mystery..
Wendy, The frosting recipe isn’t really for piping but more for spreading. 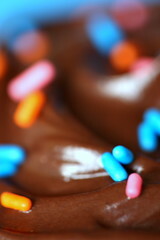 I have a lot of other recipes for pipable chocolate frosting on the blog. But if you insist on using this one, just beat in more sifted, powdered sugar at the end until its thick. Made these as a treat for my teenage daughter with the buttercream frosting. They are fabulous-turned out perfectly. You kinda addressed this in #20, but I ended up with dense, hard cupcakes. The only thing I did differently was mix all the ingredients with a wooden spoon: poor college student=no electric mixer. How did people make cakes before electric mixers? Would whisking it to death work? I made the chocolate cupcakes with buttercream frosting today. Both turned out delicious, but I had 2 problems – maybe you could help me figure out what happened? I used large muffin-type tins. I didn’t think I overfilled, but they collapsed. One thing I did wrong was forgot to add the sugar early and cream it, so it went in after some milk and flour mix. The other problem is that they stuck to the wrapper. Any idea what could have caused that? thanks! I am anxious to hear what your guests thought of the cupcakes, though I am sure they devoured them. I hope the visit was a good one. The cupcakes, as usual, look devine! and for some reason my cupcakes were domed instead of flat (which is not much of a problem, but i’m just curious)…but i followed the instructions and used the ingredients listed…i think i might have beaten the batter too much and too much air got trapped or something. once again, thanks for this wonderful recipe! Hi!You know, your blog is really amazing!!!! I’m Italian and even if everybody thinks that our recipes are so good i’ve never seen such beautiful things in my life!!! These are classic & adorable. pls help… when u say 1 teaspoon vanilla.. wat do u mean? I just wanted to update re:vanilla cupcakes. I made the recipe with half the sugar and they turned out perfectly. The chocolate frosting is the best I’ve ever tasted! Sooo yummy. I combined it with spicy vanilla cupcakes, which worked really well. Can you please put the vanilla cupcake recipe back up soon? Nicole said she just used half the sugar and it turned out great. I would really like to try ur recipe! hi there, can i say i omit the baking powder and use self-raising flour instead of plain flour? simple, cuz i can’t seem to find baking powder anywhere in Coles, Australia. pls help me out, thanks! I just made these for my coworkers and they’re absolutely delicious. I substituted regular Baker’s chocolate for the fancy chocolate because I didn’t have any on hand: didn’t matter! So good! I absolutely love your blog and the care you take with these recipes. Thanks again! The chocolate cupcakes were great esp with the vanilla buttercream icing… I love them! Yummy… I tried baking as a whole big cake the other day… And it’s turn out as delicious.. Thanks for the recipe!! Is it possible for you to put up the vanilla cupcake recipe again cos I would like to try it. 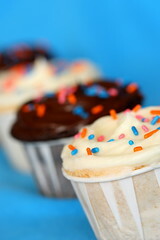 If anyone has the vanilla cupcake recipe chockylit posted up, could u please send it to me? Someone said they halved the sugar and the recipe turned out fine. I made the chocolate, and they just never rose, except up the sides. I used exactly the same ingredients (as in, from the same containers of flour, baking powder, etc) in successful cupcakes just last week, so it wasn’t what was in them. However, I’m well aware that cupcakes are delicate flowers, and if you look at them cross-eyed they fall, so I blame an off day. The batter sure tasted fabulous!!! I shall try again another time. I love your cupcake blog!! :)I would be so grateful if you could post the vanilla cupcakes recipe which has been removed…Thank you! Made the chocolate cupcakes, they turned out fantastic! Would love to see what your Vanilla cupcakes are like. Thanks for the recipe!! Much appreciated! I tried the chocolate ones and had the some problems some others had. I keep looking back over to see what I did wrong, and can’t find it. The first batch I filled the cups 2/3 of the way, and they spilled over on the sides, sunk in the middle, and stuck to the paper when I tried to get what was left out. So for the second batch I filled the cups only 1/2 full. I didn’t have any spill over this time, but they still all collapsed! The tops are crunchy, and I can’t get them out of the cupcake liner. I was so disappointed! While I was mixing them, the batter looked (and tasted) divine, I thought for sure that the cupcakes would turn out fabulous! I’ll try one of your other recipes though! Thanks for the great blog! I’ve been wanting to learn to make great cupcakes, and I’m sure I’ll get the hang of it if I keep looking around here! Your recipes are great. Could you give alternatives for microwave versions? what kind of sugar are we supposed to use in this recipe? I am going to turn these upside down and decorate with white icing and a cherry to make a christmas pudding look! This is a terrible chocolate cupcake recipe. Can anyone who actually tried this recipe say it turned out well? I under-filled the cups a bit to avoid the dreaded sinking … Made 15 cupcakes. They still overflowed and sunk. Take mercy on the unwary, and take down the choc cupcake recipe too. this is the best cupcake i have tasted by far!